GEOFFREY CIANI: Tarick, it was a big loss for the boxing world, especially the Kronk community, when we lost an exceptional individual when Emanuel Steward passed away. 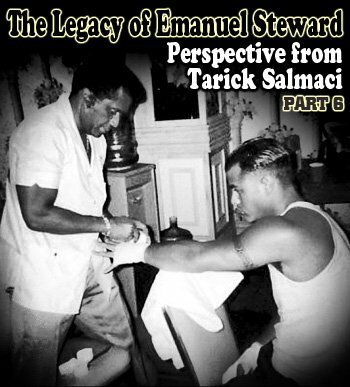 As someone who had the opportunity to work with Emanuel, what are your personal views on his personal impact on the world of boxing? TARICK SALMACI: Good question. I think he’ll always be a part of boxing. He’s part of the game. He’ll always be part of the game. He helped make boxing what it is as far as training world champions, being involved in all these mega fights he was involved in throughout the 70s, 80s, 90s, and current. It’s just when it comes to boxing he’s a legend. That’s a given right there. CIANI: Can you tell the fans out there a little bit about what it was like the first time that you worked with Emanuel? SALMACI: Let me start by saying that Emanuel, I mean I first met him when I was 11 years old. So I kind of grew up around Emanuel, and from the first time meeting him as a kid he always made you feel important. You know what I mean? That’s one thing he always did, and I noticed that as a kid. He made us feel important, and we always tried to impress him. I mean we were like 11 and 12 years old, here we are, kids from the ghetto, and this man would take us. We were young kids! And with Emanuel this was like the 80s. So he was already on top of his game. He would pick us up and take us to the most expensive restaurant in Detroit. There was a steakhouse called “Carl’s Chop House”, and he’d take about 14 or 15 of us there randomly. Every month, every couple of months, he would take us all there to experience something we never experienced before. (laughs) You know what I mean? I’m ordering the best steak, and they’re like, “Wow! I thought we were going to have like a hamburger or a cheeseburger”. He would always take us to these restaurants, and he’d surprise us with trophies for doing good in the tournaments. You know back then, when all of this is going on and you’re a young kid, you think, “Oh you know, Emanuel is probably doing this because he wants to sign us when we get older. Blah, blah, blah”, but when you get older and look back—I mean we were kids! What’s the odds of us even becoming successful pros. You know what I mean? He just went out of his way just to make us feel good. I mean I’m looking at myself now being older, it’s hard even to put time in with kids, and take them to do things, and make them feel good. But Emanuel, if you had to describe Emanuel, I’ve known him how long now? Almost 28 years, and I would say “selfless” is the word to describe him. He was a selfless person. He really was. We were like, “Wow! You know he didn’t have to do that”. So those are the kind of experiences I had with Emanuel. He used to always come to my house, my parents’ house. My parents would barbeque. You know I’m Middle Eastern, and my parents would make him a Middle Eastern dinner all the time and he loved it. He loved Middle Eastern food. He loved it, and he would always come over. You know we lived in a little bungalow, a little home. When Emanuel came he pulled up in the Rolls Royce, he’d come inside, we’d barbeque outside—and through all growing up he did this. Emanuel was smart not only inside the ring but also outside the ring. I remember one time, I always tell this story. We were sitting in my parents’ tiny living room. He’s like, and you know Emanuel’s voice, “There’s something’s coming up, something that’s going to change boxing”. This was like 1988, maybe ’89. He goes, “It’s called pay-per-view. It’s going to change boxing forever”. At the same time I’m thinking why was he telling us this. Who are we? You know what I mean? My dad was just your average worker at a factory, but Emanuel, he didn’t look at us like that. He looked at everybody the same way, and it wasn’t one of those where it was like oh he likes you because he wants something from you. What was he going to gain from us? You know what I mean? And he did that with a few fighters. Myself, and when I got older there was Octavio Lara. Octavio, he treated Octavio like he was his son. Octavio used to train at Kronk when I was like 18, 19. Octavio was a little 8 or 9 year old kid running around at the gym, and Emanuel was like really close to him and his family. He was going to try and groom Octavio to be a big superstar, but I think the mistake with Octavio was he didn’t fight consistently as an amateur. He was just waiting to turn pro, and waiting, and waiting, and waiting. And you know you got to fight to improve in this business. You got to fight as much as you can as an amateur. CIANI: Now during your formative years as an amateur, you were learning to box at the Kronk. Can you tell us what those experiences were like for you being at the Kronk Gym when you were in those formative years becoming a boxer? SALMACI: Oh man. Oh man! Those were incredible years, incredible. And even back then I noticed it was crazy. I went there like I said when I was 11, 12 years old. Myself and Oba Carr, we were all training at a different gym at the time, and Emanuel used to go out and watch the amateur fights. He loved us as fighters and he invited us to the Kronk Gym. I was like 11 or 12, so this was like ’84 or ’85 right before the Olympics you know, and I remember going down there. It was a little basement, a room in the basement of a Rec Center. It was never independently owned. It was a city Rec Center, so anybody could go train there. You pay your $20 a year fee to the city and sign your application. Anybody could go there. Upstairs they had like basketball, and they had swimming, and blah, blah, blah, and downstairs there was a little gym and a room which opened I think in the 40s or 50s, and it was a little room where the ring took up most of the room. It was the ring, two bags, and a speed bag, and that was it in the whole gym. And the gym would be cranked up to about 90 degrees in there, so right when you walked in it was hot. Just sitting there watching you were sweating. They had a little area outside of the ring where people could sit there and watch, and we had our regulars every day. Like there was this old couple that was there every single day. They would just come, you know they were retired, and they would sit there and watch. And then you had your regulars there, and then you had your regulars who were in the gym training who were loud mouths and may have instigated the fight. The gym was a full level. It was only about two feet off the floor the actual ring, so it wasn’t up high. So you’re there. So when you’re fighting in the ring all the guys would gather around the ropes, and it’s hot, and you got that head gear on and it’s even hotter, and here are you are, I’m an 11 or 12 year old kid and they matched you with someone at the gym, and you’re brawling like two pit bulls fighting. The gym would be going nuts! Somebody would take your side one day, the next day they would be against you. It wasn’t personal. You know what I mean? The guys that were down there, if they were on your side they were behind you during that sparring session. Then the next day they might be with the other guy, just to kind of get you better. They’d pump up the fights and it would be like a dog fight. These guys would be leaning over the ropes screaming in your face, in your ear while you’re fighting, and don’t forget it’s 90 degrees in there and you’re a young kid. It’s hot, and you’re just pushing, and all of these guys are around you. It was crazy man, but it was great! It toughened us up, it made us better, and Emanuel wouldn’t be there screaming. Emanuel was just, while all of this was going on, Emanuel would be on the side just looking in. Then he’d come in and give his advice. Emanuel looked at all of us screaming like it was just part of the gym. You know. He knew it was part of the gym. He never told anybody to shut up. He never got involved in all the screaming and yelling. It was part of the gym. Emanuel would just stand on the side. He knew that was part of it. Then afterwards, after you were done sparring, he would get in the ring. I was a kid, so he would start giving me hand work and showing me what I was doing wrong. And this continued throughout my whole career. Now I remember back in ’84, I remember when Mark Breland won the Olympic Gold Medal. I remember watching ABC Sports, I remember Howard Cosell, and Mark Breland was fighting, and I remember I was a little kid 11 or 12 years old just sitting on the floor with my eyes glues to the TV like wow! You know I was mesmerized by Mark Breland, Howard Cosell, and just the whole Olympic amateurs. If you notice that boxing, like Olympic boxing back then the difference it is. Like today when I watch the Olympics it’s kind of boring where everyone is wearing the same uniform, and the announcers are kind of boring, and the camera, and even the way the TV looks. Back in ’84 when it was ABC, Howard Cosell, and everyone wore their own boxing uniforms, when I was a kid I would be glued to the TV with my eyes wide open watching Mark Breland, and hearing about Emanuel being over there and helping those guys out. So to make a long story short, you know me being mesmerized by Mark Breland where I was as a kid, I always remember Mark Breland, Mark Breland, Mark Breland. I remember in like 1991 was it? 1990 probably. I was one of the top amateurs and I was at the gym training, and I saw Mark Breland walking into the gym. I guess he was coming to train with Emanuel for a little bit. I remember he walked in and I was like, “Wow! Mark Breland’s here”. Don’t forget, I was 12 years old at the time and this was the guy I was watching on TV on ABC. And here he is! He walks in the gym with Emanuel. I was like, “Wow Emanuel! That’s Mark Breland”! And I was like, “Hey Emanuel”. He was like, “Alright Tarick. Alright Tarick Salmaci! Tomorrow I want you to come in. You’re going to spar with Mark Breland”. You know what I mean? I was like oh my God! I remember that night I couldn’t sleep.I was like, “I can’t believe I’m going to be sparring Mark Breland tomorrow”. So I came into the gym the next day and we sparred, and we sparred four rounds. It was like a war and I kind of kept my ground with him, and I remember afterwards Mark Breland came out of the ring and he was upset with himself. He was like, “Ain’t no amateur supposed to do that to me!”, you know, or something like that. Then I remember Emanuel telling him, “Hey listen. This is not an ordinary amateur. He’s one of the top guys in the country, he’s one of the best fighters in the country”. And after that the next year I made the Olympic trials. I lost in the semi-finals. I lost to Pepe Reilly in a close fight, and I was going to turn pro with Emanuel at the time. This was like ’92, and I don’t know what happened with the contracts and all of that, and I ended up signing with Jackie Kallen for about four years. Then after Jackie, that’s why I didn’t go to Kronk anymore. That was like ’92 to ’96. Then I signed with Sterling McPherson out in Vegas for two years, and I even had Panama Lewis training me. Then after my contract finished with Sterling, I reunited with Emanuel and he managed me and trained me again, and that was back in ’99. Remember when Prince Naseem came to Detroit as well? He had Prince Naseem Hamed fought here, and Emanuel was working with Prince Naseem and we were all training together in the Poconos—myself, Prince Naseem, Lennox Lewis. Emanuel took us there to train and prepare for those fights. But I ended up working with him. Believe it or not, to show you how loyal he is, and I’m not saying I was disloyal. I wasn’t disloyal when I didn’t sign with him, because I was a young kid. I was 20 years old, 19/20 years old, and I had my Dad telling me what to do at the time. You know? And Emanuel knew I was young. But Emanuel to this day, before he died before he passed, he would tell me. He told me on a couple of occasions, he’s like, “I never got over you not signing with me. At the time I had big plans, and your Daddy took you to Jackie Kallen, and Jackie Kallen promised you this and promised you that”. To this day, I’ll be honest with you. Even though we worked together again, he never got over the fact that I didn’t sign with him in the beginning. But at the time I was a young kid just listening to my Dad. I didn’t know any better. CIANI: When you think of the duo of Emanuel and Tommy Hearns, how do you assess that, Tarick? SALMACI: I think that Tommy Hearns wouldn’t have been Tommy Hearns without Emanuel Steward, and I think Emanuel Steward wouldn’t have been Emanuel Steward without Tommy Hearns to be honest with you. I think they both gave to each other and they helped. It started with those two. Even though Hilmer Kenty was the first one to win a championship from Kronk, Tommy was great at the Kronk Gym and he was the first superstar, the first of Emanuel’s superstars, and them two got the Kronk name going and the Kronk legacy started for Emanuel and Tommy. CIANI: What do you think it was that enabled Emanuel to have such tremendous success with the heavyweights he worked with, and not just Lennox Lewis and Wladimir Klitschko. But even in the fight he trained Holyfield, it was the one fight that Holyfield beat Bowe. He trained Oliver McCall to beat Lennox Lewis before they had started working together. In your opinion, and as somebody that worked with Emanuel, what do you think it was that enabled him to have such tremendous success with heavyweights? SALMACI: Well knowledge! Not just with heavyweights, in general, he just had success in general in boxing with his knowledge. He’s what you would really call a boxing expert, and Emanuel was never one of those trainers that would be like, “Go! Go! Push it! Push it!” You know what I mean, that will push you. He wasn’t one of those kinds. Everything was in the brain. He was very intelligent when it came to like devising a boxing strategy, just strategically he was a genius. Boxing strategically, that’s what allowed him to have the success he had. He knew what needed to be done to win. His advice was priceless. That’s what made Emanuel a great trainer. It wasn’t, “Oh! Push it! Go run five miles! Push it!” to get you in shape. He didn’t worry about that. He had other guys and conditioners to get you in shape. His main focus was the boxing knowledge and you know strategy, what strategy to use in the ring and if you needed to switch it up in the middle of the fight, and you believed what he told you! You know a lot of fighters don’t have the confidence in their trainers when the trainer in the corner tells them hey you need to do this to win. If Emanuel told you that, you knew if you did this you would win or things would change for you. He knew exactly what needed to be done. CIANI: Tarick, I just have two final questions for you. 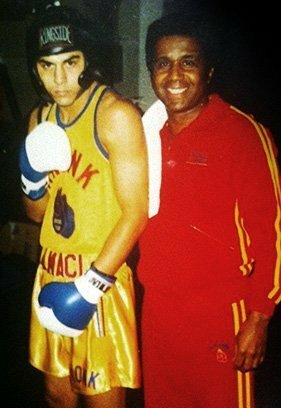 The first one: what will you personally remember the most about Emanuel Steward, and the time you two spent together and working together? SALMACI: What I will remember the most is going to be probably my childhood, of course, because like I said we had nothing. I was a kid who had nothing. Not only myself, but the other kids as well, and this man was selfless. He would take us, like I said, to restaurants, the finest restaurants. Some of these young kids, I mean God bless. I was able to after boxing, I invest in real estate now, I’m a broker here in Detroit, and you know I did pretty well for myself now. I’m able to enjoy some luxuries or whatever, but some of these guys that came up with us, that was probably the only time that they were going to ever experience like eating at a really expensive restaurant. Or Emanuel used to buy us tickets sometimes. Emanuel when we were younger, I swear we were like 18 or 19, we would want to go to Florida. He’ll buy us a ticket! “Here, you want to go to Miami on vacation? Here’s a ticket. Go ahead, go down there”. So his selflessness—that’s what I’ll remember most is his selflessness. I remember that most, and he always made us feel like we were something, and we always wanted to impress him as kids. I don’t know if I would have been boxing. Honestly, I don’t know if I would have stayed in boxing if it wasn’t for Emanuel, because I’m telling you, you always looked forward to seeing him and we always looked forward to impressing him. “He ain’t no Tarick Salmaci”. And he’d always tell me, he’d be like, “You don’t give yourself enough credit”. He goes, “Maybe you didn’t develop as a pro as you wanted to”, but he was telling me, “You’re probably one of the best amateur boxers to ever come out of Kronk”, and coming from him that meant a lot to me. Being one of the best amateur fighters ever to come out of Kronk? You bet that meant a lot to me—a whole lot. CIANI: For my last question Tarick, do you have any final thoughts that you would like to share about Emanuel, whether it was a personal experience you shared together, or something about his legacy or impact on boxing? Do you have any final thoughts? SALMACI: Well as you know he made a huge impact on boxing, and I think if he were still around he’d make even more of an impact. And I think it’s going to take boxing awhile to recover from this loss. I know life goes on, but when someone like Emanuel who is a legend in boxing is gone you feel it. You know we all miss him, and like I said we’re going to miss his selflessness and everything about him. The way it happened was so sudden. You know it makes you realize, and I’m sure you probably know this, too. It makes you realize you can’t take things for granted, and honestly I think Emanuel was taken for granted because I always thought, we or myself, I always thought he’d be here. I never thought of Emanuel not being here. You know what I mean? Just boom, out of nowhere, and we don’t know what we have until we lose it. Boxing lost something that I don’t think it will ever gain back again. You know how you have one Jordan in basketball; you have only one Emanuel Steward in boxing. I mean I’m sure there will be other great trainers, great managers, or even good people in general. But I don’t think there will be another Emanuel.